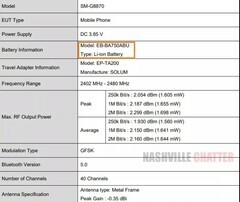 Although the FCC documents only mention that the Samsung Galaxy A8s sports Bluetooth 5.0 and a few other connectivity-related details, the rumors claim that this handset will hit the market with a Qualcomm Snapdragon 710 processor under the hood, a 6.39-inch Infinity-O display, a triple camera setup on the back, and a 24 MP selfie shooter. The Samsung Galaxy A8s has been in the rumor mill for a while, but now its launch is imminent. The handset has recently cleared FCC's testing sessions, but most details still need to be confirmed by the multination tech giant headquartered in South Korea. 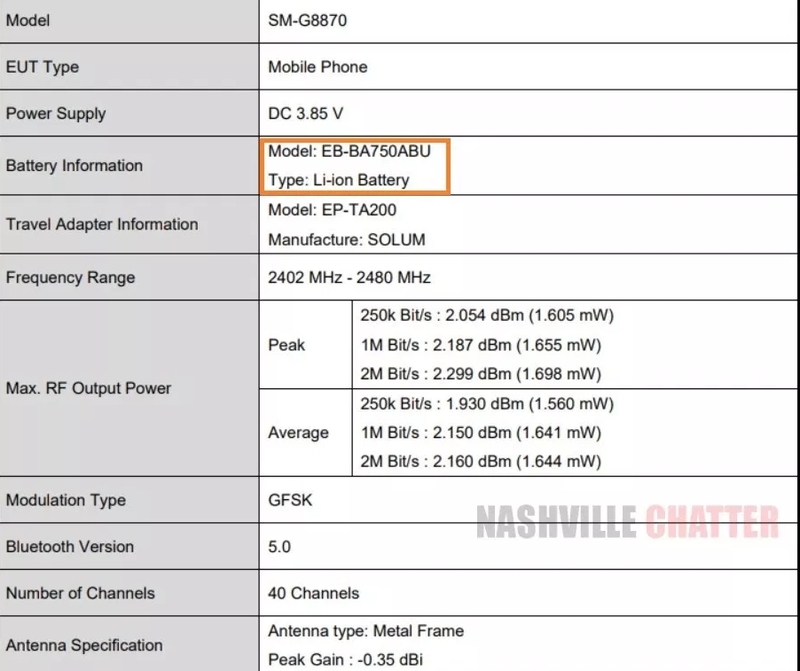 According to the FCC documents, the Samsung Galaxy A8s (SM-G8870) comes with Bluetooth 5.0 support, has a 3.85 V DC power supply and a Lithium-ion battery with a capacity of 3,300 mAh (confirmed by the Anatel certification of the same battery model), its EP-TA200 travel adapter is made by SOLUM, and some other details that most people simply don't care about can be spotted in the screenshot above. Moving into the more interesting rumor space, we can highlight the following Galaxy A8s specs and features: Qualcomm Snapdragon 710 processor, 6.39-inch LCD Infinity-O display, 25 + 10 + 5 MP main camera trio, 24 MP selfie shooter, 6 GB of memory, 128 GB internal storage and microSD support. The Samsung Galaxy A8s could hit the global market as the Galaxy A8, since Samsung did the same with the Galaxy A9s/Galaxy A9. There is no official launch date to talk about, but it would not be surprising to see this handset hit the market before the end of the year.